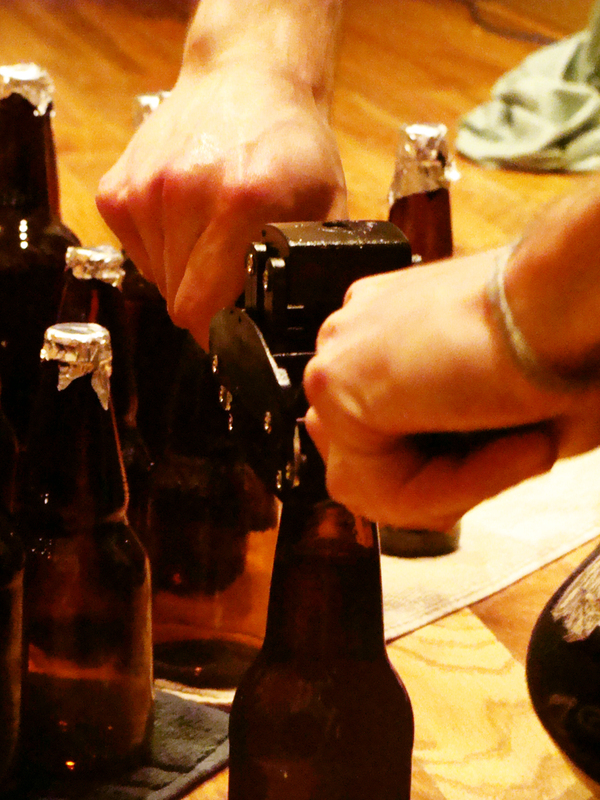 Yesterday I bottled up the brown ale. The whole process took several hours and required the help of Nick, Jason, and Colleen. There was additional preparation time (that will hopefully not have to be repeated) in washing the labels off of bottles that I’d collected from bars, parties, and discards from our own apartment. After a practice run with the autosiphon, when I learned it is a bit difficult to accurately handle both the siphon and the bottling wand, I sanitized my bottling bucket (covering the top with tinfoil while I continued to prepare), the siphon, my bottles (also covering with tinfoil), and dumped my bottle caps into sanitizer until I would need them. The bottles arrayed in waiting. In the entry on this brew’s fermentation I mentioned that the beer seemed impenetrable to light, despite having completely cleared. This made it difficult how far I was lowering the siphon and whether I was in danger of sucking up sediment into the bottling bucket. I’m fairly certain that I poked the siphon right into the sediment several times, in fact, yet due to the protective shield on the end of the siphon the beer stayed clear as it went into the bucket (where prescribed 3/4 cup of sugar boiled in water awaited it). I removed my hose and bottling wand from the siphon and attached it to the spigot of the bucket. Trading tinfoil hats for bottle caps. Both for racking from the carboy to the bucket and for filling the bottles I found the hose that was included in my starter kit was prohibitively short. I had to have Nick and Jason help me position the carboy and bucket during the racking to keep flow up at a reasonable pace. I plan to replace it when I next visit the brew shop, as well as pick up a new hydrometer since mine broke when I carelessly left it in the drying rack with some bigger, meaner cookware. I will also be picking up ingredients for the next brew (post coming soon). My brother swears by bench cappers, and sure enough the capper proved tricky to situate at times. At one point it slipped while I was applying pressure and the bottle cracked. Not one to waste, I poured the contents of the ruined bottle into a glass and decided to have another sample. The flavor has mellowed a bit, the alcohol tasting a bit less sharp than a week ago, but I think the flavor was dominated by the unfermented sugar added for bottling. 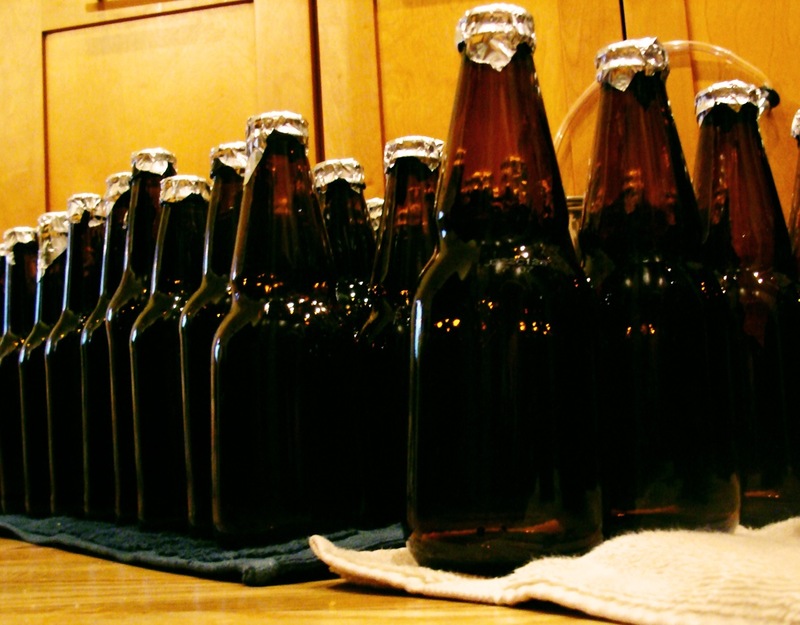 This entry was posted in learning and tagged bottling, brown ale, first brew, narrative on January 28, 2013 by Dylan Bargteil. Don’t drink glass! Love, your sister.